Pope Francis Says Gun Owners Can't Call Themselves Christians-Mostly Fiction! - Truth or Fiction? Pope Francis Says Gun Owners Can't Call Themselves Christians-Mostly Fiction! Pope Francis Gun Owners Aren’t Christian, Calls to Ban All Weapons-Misleading! Pope Francis said that gun owners and those who support gun rights can’t call themselves Christian anymore and are hypocrites. Pope Francis also called for a ban on all weapons. Pope Francis has repeatedly spoken out against weapons of war over the years. In May 2018, those comments were taken out of context, leading some to believe that Pope Francis said gun owners can’t call themselves Christians, and that all weapons should be banned. Fringe websites like Your News Wire quickly reported that Pope Francis wanted to disarm the public. But again, Pope Francis has repeatedly spoken out about the conflict in Syria, chemical weapons attacks, and “repeated airstrikes attributed to Israel that have killed Iranian fighters and prompted threats of reprisal from Tehran.” And he’d been doing so at the time he tweeted the statement. Given the tweet references “fear of war,” it would seem that he’s specifically referring to weapons of war or weapons of mass destruction. After all, Pope Francis admits that “My English is poor!” so it’s possible for details to get lost in translation. The controversy resurfaced when the website Neon Nettle published a story under the headline, “Pope Francis: Gun Owners Can’t Call Themselves Christian Anymore.” The story uses comments Pope Francis made in 2015. And, piggybacking on the controversial tweet, it (falsely) claims that Pope Francis said gun owners can’t call themselves Christian. It makes me think one thing: people, leaders, entrepreneurs who call themselves Christians, and manufacture arms! This gives rise to some mistrust: they call themselves Christians! “No, no, Father, I don’t manufacture them, no, no…. I only have my savings, my investments in arms factories”. Ah! And why? “Because the interest is somewhat higher…”. And being two-faced is common currency today: saying something and doing another. Hypocrisy.. 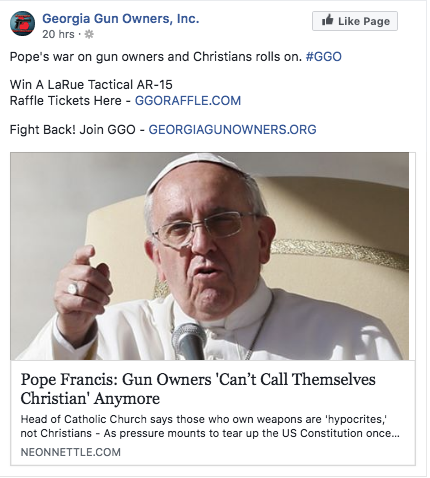 So, taken in context, Pope Francis didn’t say gun owners can’t call themselves Christian. He was talking about manufacturers of and investors in weapons of war. And he didn’t say they couldn’t call themselves Christian. He said doing so creates “mistrust.” And again, taken in context, Pope Francis did not call to disarm the public. Rather, he was calling for a ban on weapons of war. Pope Francis made comments in 2015 and 2018 about weapons of war that were taken out of context to make it appear he was speaking out against all gun owners.